Today we present this exclusive interview with Zak Littwin, designer of APB Reloaded, about APB Reloaded, their free to play third person shooter MMO. Thanks for giving us the opportunity to interview you about APB Reloaded. First of all, could you introduce yourself to our readers? How would you describe APB Reloaded to someone who has not heard about it before? Simply, APB Reloaded is a third-person shooter MMO that is a digital version of cops and robbers. The game itself is an open-world environment based in the fictional city of San Paro that has been overrun by a massive, organized crime wave comprised of several crime syndicates vying for control of the city. Overwhelmed and out-gunned, the San Paros government has instituted a radical policy that allows for private business and civilians to serve the city in a form of legalized vigilantism. This is the world that the player enters after choosing a side, either as a Criminal or a peace-keeping Enforcer. Everyone knows the sad story of the original APB game, but why did you choose to take a chance and invest in this game? As a member of the original APB team for several years, I have a lot of history with the title. When GamersFirst came to pick it up, I naturally jumped at the chance to be involved again. APB as a project has a massive amount of potential and while it never had the chance to be fully realized before it shut down, I definitely feel that we can mold it into something very special. For how long has APB been in development to become APB Reloaded? Weve been reworking and updating the game since we got through the acquisition back in November, so at this point were running up on the six-month mark. Why did you call APB Reloaded, keeping the original APB name? At its core, the vision of the original game remains intact. Though were making a lot of changes and additions to fix what we feel were issues with the original product, the premise and feel of the game is still the same. Also, while APB got a lot of publicity and it makes sense to keep that name recognition rather than starting from scratch. Gamers that found the concept interesting but did not purchase it can now experience the title for free, and invest into it as they see value. It also highlights to players that previously purchased the game but stopped playing for whatever reason that were back and also conveys that we know there were issues and are committed to fixing them. Lastly, the original APB audience remains very loyal to the game, as our message forums show us every day. It again makes no sense to alienate these fans that helped make the property so attractive to us in the first place. Lets talk about changes. What are the main differences between APB and APB Reloaded? One of the major changes weve made is to try and move away from the linear progression that was seen in the previous iteration. Rather than progress and get better stats all around, you instead unlock modifications to your character, weapons and vehicles that give you different abilities or stat tradeoffs. Weapons are dealt with in similar ways, with the rifle new players now start with being a well-rounded weapon that can compete with any of the ones unlocked later. This creates an ad-hoc class system where a team will want to kit out individual members of the team with varied modifications in order to be most effective. New players entering the game are effectively jacksall-trades as far as stats and skills are concerned, so can still compete on equal footing. Talking about weapons, weve also made a lot of changes to make the weapons feel more visceral. The recoil system added previously in one of the last patches to APB has been tweaked, and the weapons have been made a bit more powerful so players arent bullet sponges. This has been a fairly controversial change with our veteran player-base, though is certainly helping with making the weapons feel powerful and engaging. Were working with the community both in-game and through the forums to get a good balance between a high-lethality damage model and still giving players enough time to react to incoming fire. Other major changes include implementation of an intelligent spawning system, adjusting vehicles to be more unique and fun to drive and changing the progression system to allow players to unlock new modifications and weapons by using certain items. Whats the current status of the Beta? Is there a date for the Open Beta or the final release? Were looking at moving into Open Beta in the next few weeks. We dont have a specific date yet for final release, though itll likely be some time in Q3. Give us a sneak peek on the new vehicles system, vehicles and driving. The very first thing we did was throw away the old starting vehicle. As well as looking like a painters van, it also handled horribly. So rather than using the wooden sword approach, we replaced the vehicle with a cool two-door coupe thats very quick, maneuverable, and almost impossible to knock over. The results is a very easy to learn vehicle that provides a good starting experience and is great for weaving through traffic. On the other hand, its not particularly fast or sturdy, so if you want to go down those routes, you will need other vehicles. The other vehicles have been made more diverse, so handle more like they look. The Vegas G20, our classic muscle car, is a beast off the line but once its going it tends to keep going in that direction. Likewise our low-rider, the Dolton Fresno, is now very heavy (being made entirely from steel) and has really bouncy suspension, but isnt going anywhere in a hurry. This gives each vehicle its own situational usefulness, and gives players a reason to utilize the whole range of vehicles. Overall the vehicles tend to be more unique in handling than before, and more competitive. You shouldnt find yourself in a situation where a vehicle you jump into is useless, though you may feel its not to your tastes. Weve increased the rate at which most of the vehicles turn also, so the latency issue people saw in the handling at launch is much reduced. Talking about future, what are you planning beyond release? Theres a lot were working on at the moment. Were continuing to work on a Turf Wars ruleset, where Criminals and Enforcers will fight to control individual blocks of the city, vying for total supremacy. Along with this, we are also working on a new action district called The Asylum, an abandoned insane asylum used by the Criminals for Underground Raves. Were also looking to implement a racing mechanic, elective PvP mechanics (the ability to challenge an enemy team), and a DJ battle mode for our music studio. We plan to be supporting this product for a number of years to come, and with a game that has so many different aspects, the list of what we want to add just keeps on growing. What can you say about the payment model, premium upgrades and the free to play limitations? What are the differences between a free to play player and a premium player? Well, as you know, GamersFirst has been doing the Free2Play model for quite some time, and we have what works and what doesnt down very well. Were going to have two different pay options for APB Reloaded players; the micro-transaction and premium accounts. Micro-transactions are open to both free and Premium players and are for specialized services or in-game items. These will run the gambit from vanity clothing and cool vehicles to additional character slots. I would like to stress that the weaponry will not be overpowered or game-changing, but change the owners play style.Take the sniper rifle as a theoretical example.The weapon achieved in-game does 95% damage with one hit, but you cannot sprint while its equipped or hang out of a vehicles window with it. The pay model is a similarly looking rifle; however now you can sprint with it, but it will only do 50% damage. Still a 2 hit kill, but it changes use of the weapon significantly. Likewise a lot of the additional weapons we are adding are visually a lot more striking than the normal counterparts. While the most audacious weapon were selling is a gold plated magnum with scope and extended barrel, the community favorite at the moment appears to be the CSG-20 Shotgun, which while fairly plain, is an elegant design that the beta players are really appreciating. Premium players will have the same experience as free players, with a few advantages.They will gain experience and in-game cash faster, and have unfettered access to the customization studios. 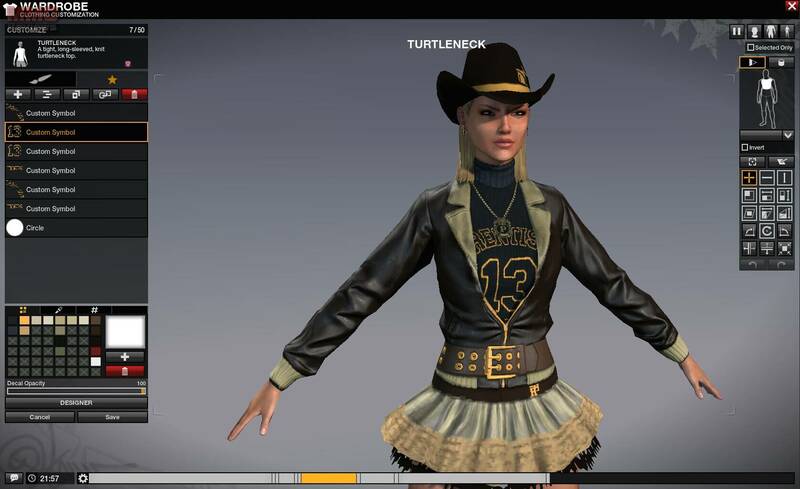 While free players can play around with the customization studios to their hearts content, they can only save and wear items that have a limited number of symbols on them. Premium players have a much larger limit. There will also be some premium-exclusive content in the future, but were not ready to reveal that just yet. What kind measures have you set to avoid hacking? Punkbuster is going to be back in a big way for APB Reloaded, along with a few other countermeasures that complement it well. We plan on being very aggressive on policing hacking and cheating within APB Reloaded. This power will be delegated all the way down to our full complement of GMs who will be on 24/7 looking for abusers. Only that were really excited about getting APB Reloaded out to gamers. Were looking at beginning open beta testing in the next few weeks, so be sure to check in at our Facebook page or Twitter feed to see when you and your readers can jump in and experience it for yourselves. Thanks you so much. Its always a pleasure.